As always when we find ourselves awaiting a new soon-to-be-released Young Thug album/mixtape/symphony, we are living in a historic time. Slime Season 3 (SS3) is coming (Feb. 5th) and all we have to do is make it until then, which is easier said than done. OR it would be, if we didn’t already have such a readily available source of Jeffrey Williams’ music on our laptops, phones, and archives. (This statement is actually not representative of my life at this time, my laptop crashed and I have like 3 things on my iTunes right now so this is where I’m at currently). Thankfully, Young Thug throws songs and mixtapes up like JR Smith throws up 3 pointers and this is all just to say that the man has crazy amounts of music. In preparation for SS3, I thought it would be fun to look back at a former Thugger release that many of us remember fondly (in actuality this is one of the 3 things I have on my iTunes right now sooooo). So let’s look at Black Portland’s “Black Portland”, a release I would say is a “classic” and yes “Black Portland” is actually a Young Thug and Bloody Jay project but I’m sure it will all be alright. In 2014, Young Thug was winning; there’s no other way to say it (consult the image at the top of the article) and Black Portland consequently became one of the Greatest Hip-Hop Groups of All Time. The pairing of Thug and Bloody Jay, who is a terrific rapper in his own right, put out this tape and livemixtapes.com shut down the day it was released due to web traffic, or so they say. What we’re gonna do here is run through some of the songs that stood out on the tape. But be advised: everything on it is a gem, and you should proceed as follows (download it immediately). Off top, here’s the cover, which as you can see is an instant victory for the group. 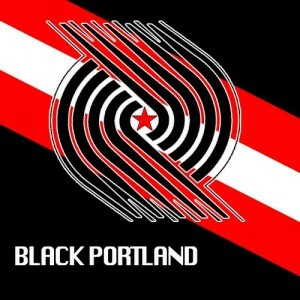 Those of you who caught that JR Smith reference made above might recognize this as the logo of the basketball team, the Portland Trail Blazers, except this version of the logo has been made much cooler for obvious reasons. Now for a bit of context, the 2014 Blazers were quite a team, as they won their division and made it to the playoffs. They lost in the first round but that’s hardly important and obviously Jay and Thug aren’t losing at anything here so like I said, this is a great starting point for a great tape. “Florida Water” – This is a lullaby, straight up. How could you not fall asleep to this song, letting those synths wash you out, with the the added bonus of Thug and Jay singing over each other? Throw on this 2k14 throwback while you’re shopping for some hard-earned jewelry to complete your 2016 glo up, then run it back while you’re heading down to The Sunshine State for some relaxation. “No F*cks” – This intro is incredible right? You can tell this song was just maaaaade for Waka to rip it up; it’s a real shame he’s not on it. Young Thug and Bloody Jay are more then enough to make this song work though, and they ride this beat like they’re going to war. Who’s your favorite rapper and did they ever say “Peter Piper Pick a Pepper” in a verse and pull it off like Jay? If not, it sounds like you need a new favorite rapper but that’s none of my business. “Movin” – Wow this was such a hit back in high school and it’s aged so so well. This sounds ridiculous in a car, let me tell you. There are so many things that Thug and Jay do in this song that blow me away, from Young Thug purposefully mumbling his way through part of his verse and still killing it, to Jay calling himself “R.L. Slime.” Why did Thug mumble? Because sometimes they just don’t even deserve a verse, and you just gotta keep it movin. “Paranoia” – This song writes its own review, I assure you. Just listen to it. This is some classic-ATL 808-Lex Luger type-destruction here. “Danny Glover” – Alright, this song also needs no review, but I don’t want to be seen as lazy, so here it goes. This song was a large driving force behind Thug’s dominance and buzz in 2014. It was the song that enraptured people from Kanye to my prom bus driver, making them nod their heads and flat out dance. Such is the reach and brilliance of Jeffrey. He just makes people happy, and we can all get behind that, no? Honestly, this song was the best rap song of 2014?? “Lets Go Play” – A fitting ending to one of my favorite mixtapes ever. The triumphant, all out joyousness of this track sorta foreshadows the equally triumphant victory lap anthems that Young Thug would go on to create with Rich Homie Quan later in 2014, as Rich Gang (their first tape is another of my all time favorites). 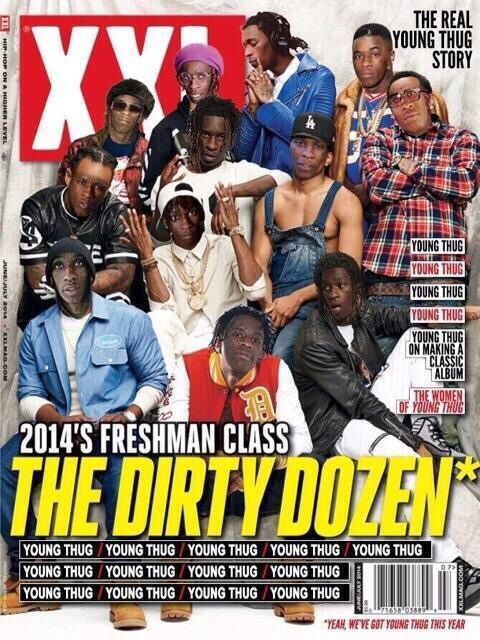 If you haven’t heard that 2014 Rich Gang tape…..well you need to get on that, I’m only trying to look out for you! Putting all this 2014 nostalgia aside, Young Thug really is the savior of rap and Atlanta and of some other things too, probably. 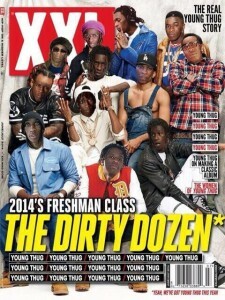 So when you’re listening to SS3 and thinking to yourself “wow how can I discover some more of this young man’s oeuvre, and study the come-up?” just consult this humble post and, uhh, the prior Slime Seasons (1 & 2) and also Barter 6 and 1017 Thug and also the “I Came From Nothing” series if you’re really about being a Young Thug scholar/archivist.